Where were you today at approximately 1:15 pm? 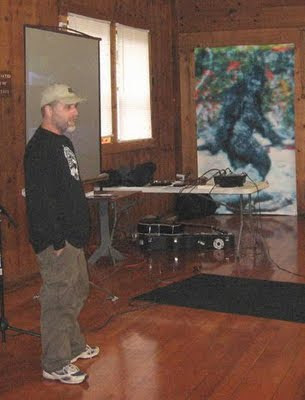 I'm a total bigfoot nerd. 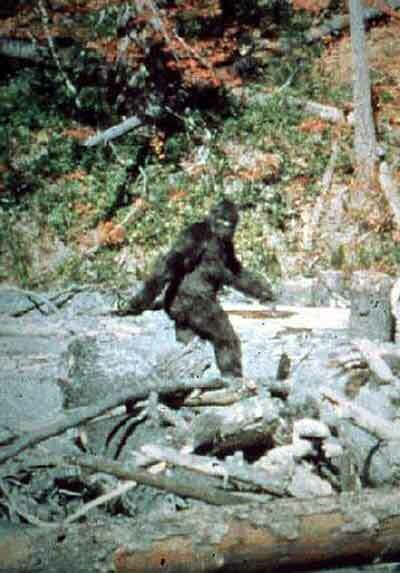 I celebrate the anniversary of the Patterson/Gimlin Film every year. This year is no exception. Most years, I'm teaching at that particular moment. Usually I notice the time. Sometimes that magical moment slips by and I don't remember to take note until a couple hours later. Still, I always notice at some point. It's kind of like a personal holiday, but one on which I have to work. Maybe that will change after Discovery Day. It was probably the PG Film that set the hook in me back in the mid 1970's, as far as my personal path into bigfootery goes. That and "The Legend of Boggy Creek" (I've always loved monster movies). 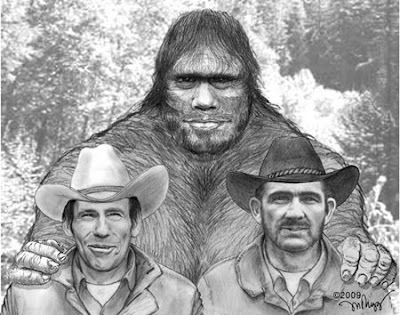 The Patterson/Gimlin Film has played a prominent role in my life ever since, though its influence has been laughingly heavy for over a decade and a half. When I first started camping with the sole purpose of "looking for bigfoot" back in 1994, it was with the intent of finding the PG Filmsite (which I failed to do, but discovered possible footprints). I was also looking for the PG Filmsite when I found myself over three miles up river, off trail, in the dark without a flashlight wearing shorts, a tee shirt and river sandals (not a good situation, but I'm a little wiser for it now). 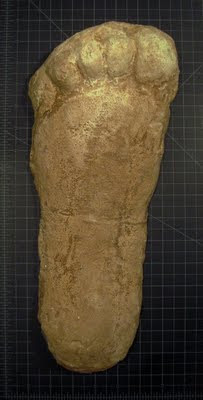 My first bigfoot cast was the right foot of the PG Film subject (bought from Dr. Grover Krantz himself). I have now visited the PG Filmsite no less than a dozen times. I was the first person I'm aware of to get a GPS reading at the site, though Daniel Perez was the first to publish the numbers (he was there two or three weeks after I was back in 1997). I have had possible bigfoot action at or very near the filmsite on three occasions. I am aware of several others who have also possibly encountered one of these creatures there too. However, I am not aware of any sightings from the filmsite except for Roger and Bob's, though that would be cool. Several years ago, I had the pleasure of accidentally running across Tony Healy, author of the excellent book, Yowie, The Search for Australia's Bigfoot while on expedition at Bluff Creek. My field partner and I escorted Tony to the PG filmsite and spent a great night with him at this historic spot. 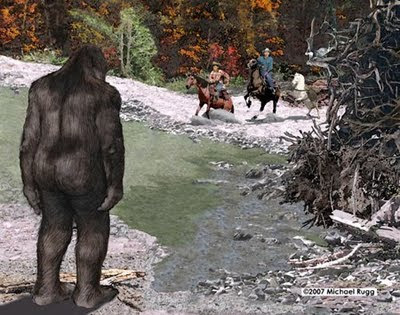 No bigfoots were heard, but many stories about them and their Aussie cousins were. I was honored to have been invited to speak in Willow Creek at the 40th Anniversary Celebration of the PG Film. The title of my presentation was "The History of the PG Film Subject, 1958 - 1967", which detailed the numerous times that Patty's footprints might have been found prior to the film, dating back to the late 1950's. Also speaking at this event were James "Bobo" Fay (who told about early investigators in the Bluff Creek area dating back to the late 1940's), Scott McClean (who went over the media's written accounts of the film), Daniel Perez (a widely recognized expert in the history of the film), and the biographer of Roger Patterson, David Murphy. It was held on October 20th, and we spent that night in the cold backcountry of Bluff Creek at Louse Camp, just three short miles from the filmsite. Only later did I have the distinct privilege of befriending Bob Gimlin. I have spoken to Bob numerous times about that day, 42 years ago. Many subtle details have been shared about that day which enriches the PG Film for me, whether it was the torrential downpour that nearly stranded Roger and Bob, or the fact that Bob had to "borrow" a front loader (that luckily had the keys left in it) to pull his truck out of a dangerous, muddy situation half way up Onion Mountain (this event left a dent in Bob's hood, which can still be seen today). It was also from these conversations that I suspect that they did not camp at Louse Camp as is widely reported, but rather at the Notice Creek landing, just a short distance away. Minor details, to be sure, but when you're a bigfoot nerd, that stuff is cool. However, as amazingly awesome as the PG Film is, I would like to encourage those who can to try to get another film of equal or better quality. The PG Film set the bar intimidatingly high for visual evidence. I'm out there trying to get new footage kind of a lot, even for a bigfooter. Maybe you can't get out as much as I try to, but there's a lot more of you than there are of me. The odds are squarely in your favor. Learn from the past. Roger and Bob had a good strategy, and one that can be recreated. They were in an area that had recent activity, in this case footprint finds (the Blue Creek Mountain prints, and the Onion Mountain print, both from August of 1967). They spent multiple days poking around and enjoying the great camping in a remote area. 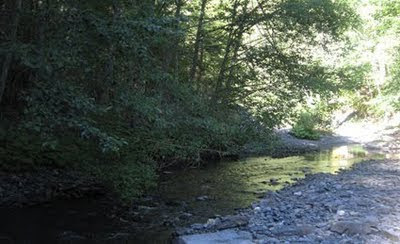 They scoured the creek beds looking for footprints (probably the only place with a real possibility of recording footprints in that area). Roger kept his camera close to him and readily accessible. All of this paid off. You can do most, if not all of those things. That means you potentially could get really, really, really lucky too. But, if you don't try their method, TRY SOMETHING! Get into the woods. Bring a camera. Believe in luck. Oh yeah, one more thing... Happy birthday to fellow bigfooter Autumn Williams! Consider yourself hugged. Cliff, thanks for this article, and all the other great work you do. I hope you don't mind, but I put a link to this article and your blog, on my newly started BF blog. 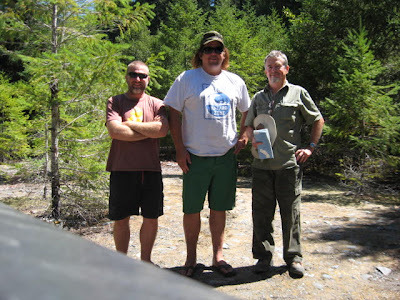 http://sierratahoebigfoot.blogspot.com/ Thanks again! Bigfoot Halloween Costume, on the Cheap! Rights for the Great Apes?